We are once again teaming up with our friends at Upper Deck Entertainment to offer readers a shot at a UD Marvel Hobby box. In this case, the lucky winners get a free box of Upper Deck Marvel Annual 2017. 2017 Upper Deck Marvel Annual revisits the prior year in comics using a detailed format that also includes one sketch or patch card per box. Enter below and then review the set details and a full checklist using the 2017 Upper Deck Marvel Annual profile. 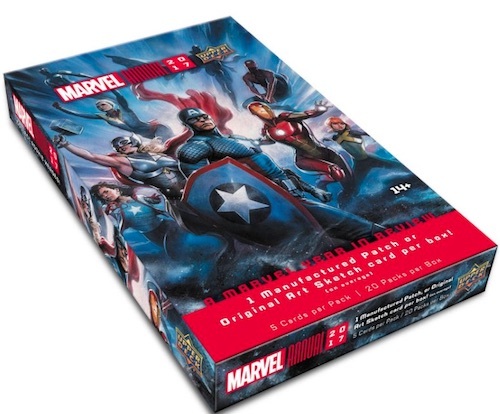 We are picking two winners to each receive one box of Upper Deck Marvel Annual 2017, and the contest is open to those in Canada and the United States. 2017 MARVEL ANNUAL PATCH MEMORABILIA LOT! CAPTAIN MARVEL HULK FALCON MORE! 2017 MARVEL ANNUAL DUAL PATCH MEMORABILIA LOT! BLACK WIDOW SPIDER-MAN MORE!